Later this month, the Diet’s Upper House will pass a bill submitted by the ruling coalition addressing the problem of hate speech, specifically directed at non-Japanese. As sociologist Takehiro Akedo explains in his article for the Web magazine Synodos, the Liberal Democratic Party isn’t enthusiastic about the bill, but when the Democratic Party of Japan was in power it drafted its own, so the LDP feels it has to follow through, especially since the U.N. has told Japan it needs such a law. Akedo pointed out the bill’s flaws: The definition of victims is too narrow and — a flaw in the DPJ draft, as well — there are no enforceable punishments. The main opposition party complained that the LDP bill doesn’t even “prohibit” hate speech. In order to appreciate how pointless the bill is, it’s important to know that the main target of Japanese hate speech is resident Koreans, most of whom were born and raised here. Since they don’t have Japanese nationality, they are technically foreigners, though many have never stepped outside of Japan. The government has always insisted they can become Japanese nationals, and each year about 7,000 do, but in any case, many want to keep their Korean identity. In his 1991 book, “Zainichi Gaikokujin” (“Foreigners Living in Japan”), Hiroshi Tanaka writes that after World War II, Japan reserved the right to decide on whether Koreans could naturalize, whereas almost all other erstwhile colonial powers at the time left the naturalization decision up to their former subjects. Though many Koreans “returned” to the peninsula, a large portion stayed and, in order to preserve their language and culture, which had been taken away by their Japanese overlords, they built 525 schools in Japan within a year of the surrender. This did not sit well with the government, which refused to recognize these schools. Those sentiments were duly expressed by Prime Minister Shigeru Yoshida in a letter to Gen. Douglas MacArthur, head of the U.S. Occupation authorities, in 1949 suggesting that all Koreans in Japan be deported, citing as reasons their lack of “contribution” to rebuilding the country and their seemingly inherent penchant for criminal activity. In the 1950s, after they had lost their Japanese nationality but were permitted to remain in Japan as resident aliens, these Koreans were registered as people from Chosen — Japan’s name for the Korean peninsula before it split in half after gaining independence in 1945. Since there is no Chosen, these full-time residents of Japan are people without a country. 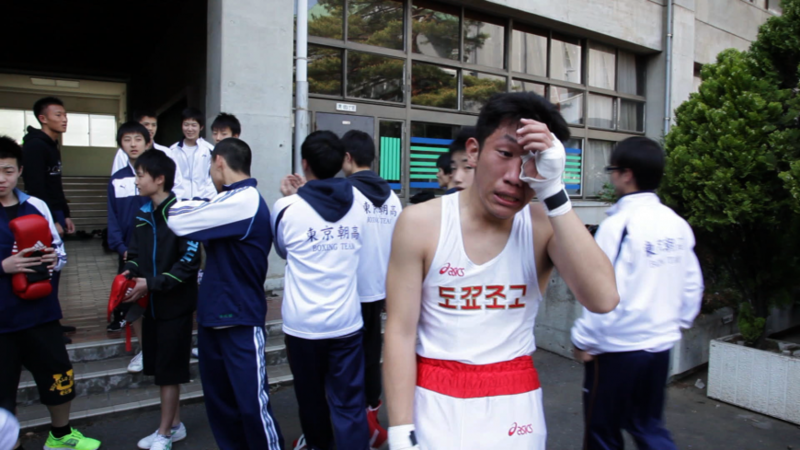 This amorphous national identity is the subtext of Lee Il-ha’s 2015 documentary, “A Crybaby Boxing Club,” about North Korea-affiliated Joseon High School in Tokyo. The prologue offers a summary of what life is like for Koreans in Japan and includes footage of demonstrators spewing hate speech, which reportedly shocked South Korean audiences who apparently know little about the Korean situation in Japan. 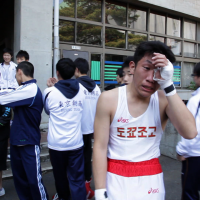 Lee, who is South Korean but now lives in Japan, made the film for that reason. To the resident Koreans on the screen, Chosen is an ideal, a kind of Valhalla: pure and impossible to achieve. During a school sports festival one elderly man tells Lee why he and other Zainichi (resident Koreans) rejected South Korea. They believe the dictator Park Chung-hee, who ruled the country from 1962 until his assassination in 1979, betrayed them when he said they should become Japanese since that’s where they live. Many shifted their allegiance to North Korea, which, culturally at least, leans closer to the concept of Chosen. The school has paid for that choice. The central government has tried to withhold subsidies and female students no longer wear traditional Korean dress during their commute to class, since some have been attacked by anti-Korean fanatics. They change into such attire after they arrive. Perhaps because Kenjiro Minato, the director of another recent documentary about resident Koreans, “Hana no Yo ni Aru ga Mama ni” (“Just Like a Flower”), is Japanese, he takes a more cautious approach to the question of identity. His subject is Bae Ewha, a resident Korean from Kyoto who makes a living as a traditional Korean dancer and also gives lectures at schools on human rights. Unlike the boys in Lee’s movie, Bae engages with Japanese counterparts in order to “change society,” and Minato keeps the mood positive. Much of the film is about Bae’s late father, who was brought over from Korea before the war to work in a mine. The theme is overcoming adversity, and while Japanese injustices are readily described, she acknowledges that she is also Japanese, at least in sensibility, and says she longs for the circumstances enjoyed by Americans, who can celebrate both their ethnic identity and their U.S. citizenship without compromising either. It is ethnic identity and the determination to hold onto it that enrages the parties who use hate speech against resident Koreans. And while the government has softened its hard line over the years — naturalized Koreans no longer have to assume Japanese names — there’s still enough equivocation in its position to encourage anti-Korean feelings. No well-meaning but inactionable gesture is going to change that.